I just wanted to take a second and report on what was accomplished this week before heading out for the weekend. 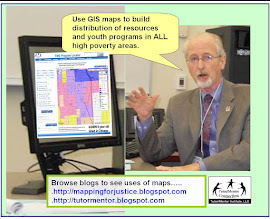 We've been taking inventory of the Tutor/Mentor Connection Map Gallery, and will be updating many of the gallery maps with up-to-date data. Now, this is not to say that the maps in the gallery are out of date... all of them are still useful, and it's well worth going and poking around when you have a few minutes. But sometimes data changes over time. When this happens, it's helpful to have our gallery maps reflect these changes in order to paint the most accurate picture. For instance, Tutor/Mentor location data is constantly changing. We store known T/M locations in our database, and T/M program info is available to you via a searchable interface, or an interactive zip code map. That data that comes up is constantly maintained and updated. Thus, whenever Nicole and Chris discover new programs or new information about known programs, our maps might look a little different.